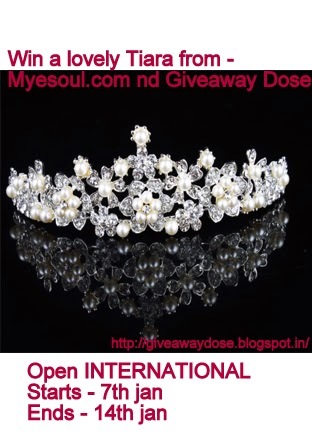 Giveaway dose: CLOSED Win a lovely TIARA !! MyeSoul.com, the internet shopping gallery, where you'll always find the latest and greatest products at prices you can afford. As Wedding is the most important moment for every woman in the world, so MyeSoul.com is offering one of their good quality gorgeous tiara, the pearls are handmade not natural. It looks absolutely gorgeous! The winner is a lucky person!